"Team effort"- two words that carry so much weight on many different levels. With Cam's development, we've witnessed team effort excel and succeed with different individuals over the years. 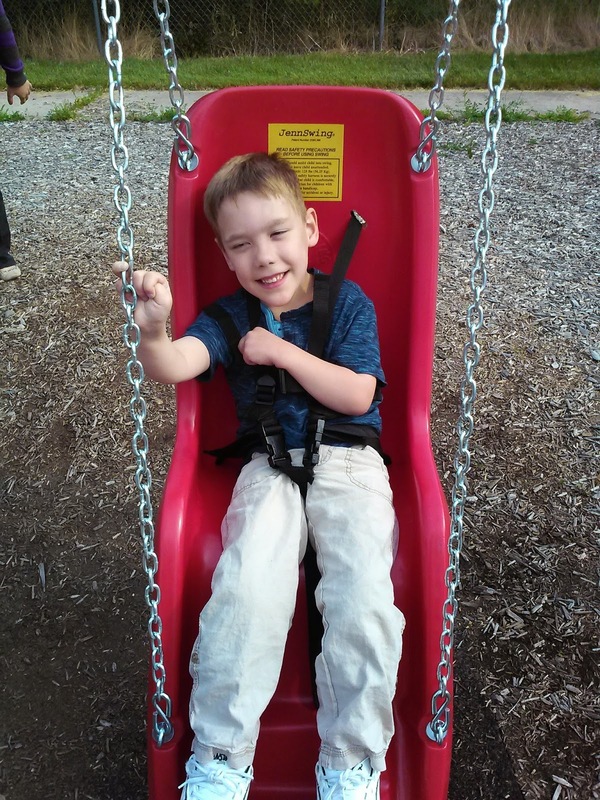 This week included Cam's last few days of summer school and little did we know there were multiple people involved in obtaining the swing shown, now installed on the Meadowbrook Elementary playground! Note the very smiley boy! Many people don't realize that a small army is sometimes required to procure special equipment. Way to go, team! On Friday, we had a long overdue date with our good friends, the Nolan family. Cam's buddy Liam, his parents and little brother had never been to Boulder Ridge Wild Animal Park. And surprisingly, even though Cam has visited multiple times, this was Chris' first visit as well. Our favorite part about the park is how up close and personal you can get to the animals. Cam loves feeding them and the giraffe was most cooperative about eating crackers. The safari tour is a treat - it's a 15 minute ride filled with interesting info, exotic animals, and one of Cam's favorites- the bus itself! On Sunday, we ventured to Stony Lake to visit our second families and have some fun in the water. Jane grew up with these awesome people and has seen them most every summer. Cam used the paddleboard as a surf board of sorts while soaking up some sun. He thought it was pretty cool that he was able to glide underneath the dock. It was Cam's first time solo on a board and the calm waters helped him gain confidence. His mom couldn't resist trying out the paddleboard as well and was quite surprised by how difficult it was! An easier water sport was definitely sitting on the board with Cam. We shared a most delicious dinner with the families and none of us could resist Oma's homemade blueberry and apple pies she brought for dessert. Cam had his first taste of blue moon ice cream (what else would you complement blueberry pie with?) and loved it! The lucky boy even opened some early bday presents. Sarah, pictured here with Cam, is currently completing her graduate studies in speech therapy in Colorado. She says Cam is an inspiration to her. We know she will inspire many children in the future and we're happy Cam can play a role in that. For all of our "teams" in this world- our heartfelt thanks! !